Thousands of Doctor Who fans have contacted the BBC to complain that the ending of Saturday night's episode was ruined by a trailer for the next show. The on-screen caption featured an animated cartoon of presenter Graham Norton, host of Over the Rainbow. 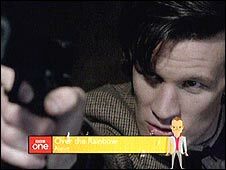 It appeared as The Doctor, played by Matt Smith, was making an emotional speech during the story's cliffhanger ending for The Time of Angels. The trailer was seen by millions of viewers watching on BBC One in England. Fans have also been complaining on social networking site Twitter. One wrote: "Why is the BBC treating its audience like idiots?" Another said: "Don't blink or Graham Norton will catch you." The BBC often promotes programmes in this way but the corporation has acknowledged that in this case the scheduling was inappropriate. A BBC spokesman said: "We apologise for the timing of Saturday night's trail." It is not the first time an unexpected appearance by Norton has angered Doctor Who fans. When the series returned in 2005 after a 16-year break, a technical error caused Norton's voice to be briefly heard over the episode's opening scenes. Who on earth is Matt Smith?